Microphone Earbuds with high quality sound for use with mobile phones or listening to music on an iPod or other mp3/mp4 devices. Wide noodle style cord prevents tangling. Comes with zippered pouch with mesh pocket for convenience while traveling or on the go. Volume control located on microphone. 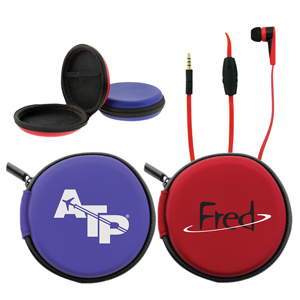 Red with Red case or Blue with Blue case, both with black trim. SKU:T-411. Categories: Tech Tools, Promotional Merchandise. PRICE INCLUDES ONE COLOUR, ONE LOCATION IMPRINT. Initial set-up charge applies. Additional colours/locations are $0.20(G)/pc/colour/location, plus a $60(G) setup charge/colour/location.